Acoustic Guitar Magazine holds an “offsite” event every year at the NAMM show (National Association of Music Merchandisers). The NAMM show is the largest annual music “trade only” conference and trade show in the United States. Acoustic Guitar Magazine holds “The Acoustic Cafe” at the Anaheim Hilton hotel on the grounds of the NAMM show. This is an invitation only concert that features some of the greatest guitar players in the industry. 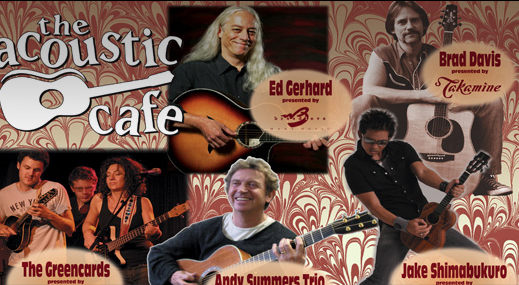 The Acoustic Cafe was an annual institution from 1998 to 2010 and Teevan Productions was honored to produce every one of those years. Celebrity Guests: John Sebastian, Roger McGuinn, Lawrence Juber, The Waybacks, Ben Verdery & William Coulter, Chris Hillman & Herb Pederson, Mark Goldenberg, Kaki King, David Jacobs-Strain, Eric Johnson, Sandro Albert, Billy White Acre , California Guitar Trio , Bernie Leadon. Mike Marshall and Choro Famoso, Ed Gerhard , Brad Davis, The Greencards, Andy Summers. Jake Shimabukuro. Monte Montgomery. Tim O’Brien.